As some students in areas hit by the Philippines’s devastating Typhoon Haiyan troop back to school this month, the government’s efforts in rebuilding the education service has been met with concerns that, seven-months on, access to learning remains a challenge for far too many children. 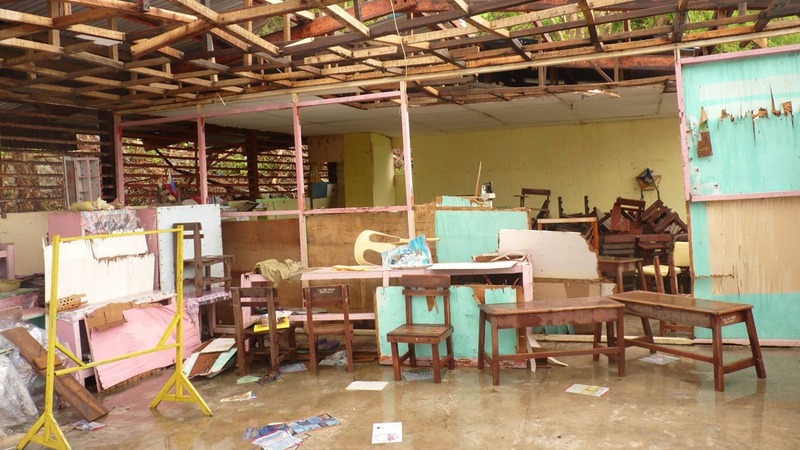 The category 5 super typhoon that ravaged the central islands of the Philippines in November 2013 damaged some 2,500 schools and affected an estimated 1.4 million school-aged children. More than 500 day care centres were completely damaged and more than 2,000 suffered partial damage. Government and aid agencies took advantage of the dry summer months of March and April to fast-track classroom maintenance. But, “classroom repairs are still a major problem,” Manan Kotak, an education specialist for the United Nations Children’s Fund (UNICEF) told IRIN. As of 14 May more than 4,200 temporary learning spaces – tents or temporary structures made of corrugated metal and wood – had been established and over 515,000 children and teachers had received teaching and educational materials to replace those lost in the storm. Department of Education (DepEd) officials reported 90 percent of students are enrolled in school, but with a lower rate registered for high school. “In spite of gaps, we see that education in the typhoon-affected areas is slowly coming back,” said Prudence Martinez-Sanoy education advisor of the development agency Plan International. Yet as the affected regions re-build, some educators feel the recovery efforts are taking too long, and fear for the upcoming cyclone season. Experts and officials say overhauling education has to take a two-pronged approach to ensure both quantity and quality is revived. According to Luisa Yu, DepEd regional director, 35 percent of the totally collapsed and 53 percent of the partially damaged classrooms have already been repaired. But in some areas, road conditions and remote relocation sites mean children still miss out on classroom time. To address this gap Plan, in partnership with other organizations, distributes “self-learning kits” containing workbooks, quizzes and exercises that children can complete on their own. Classrooms were destroyed by Typhoon Haiyan in the Philippines, leaving tens of thousands of students without schools to attend. And, Yu admits, even for the children who can access temporary or regular school structures, the environment is not ideal. “The students are coming to school, they are eager to learn. But we still have the problems of congested classrooms and a shortage of instructional materials and school furniture,” she explained, adding that in some classrooms there are three students sharing one desk. The government set a target to complete construction of partially damaged classrooms by the end of 2014, and fully destroyed structures by the end of 2015. “Completion of the reconstruction will really help the children. We first have to address access to education then quality of education. We cannot right now address both,” Yu said. However, not all educators are pleased with the progress to date. In Leyte province, where more than 80 percent of fatalities were recorded, four schools in the city of Tacloban continue to be used as evacuation centres to house 578 families – exiling students from their classrooms. Some worry that the recovery is not on track to prepare them for the upcoming cyclone season, which begins in June and lasts through November. “It’s been more than six months since Haiyan and the progress has been slow,” said Leo Candido, Chief Superintendent of Hernani, a town in Eastern Samar, one of the provinces worst devastated by the storm. The Typhoon Haiyan Strategic Response Plan calls for $US46 million for education reconstruction, 60 percent of which had been funded as of 14 May.